The poster collector Paul Lipschutz from Stockholm is internationally well known, but swedish posters are not, for reasons I do not quite understand when I look at some of the pictures in his book. 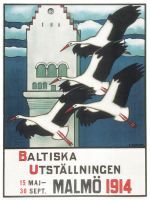 Without Lipschutz and his passion for posters, we would know even less about an art that was flowering in Sweden in the 1920's and 1930's like in many other european countries but gradually disappeared into insignificance after the war, compared to posters in Poland, France, Switzerland or Japan for example. For many years, the Lipschutz collection of about 20' 000 items covering different subjects and countries, collected over a period of 50 years, was housed at the Moderna Museet in Stockholm, and selections from it where shown in exhibitions not only in Stockholm, but New York, Beverly Hills, Paris, Oslo, Taormina, and in various catalogues and books. In 1994 the dutch poster magazine Affiche published an article by Katarina Oscarsson pointing out that Lipschutz was looking for a buyer for his private collection, and in 1998 Van Sabben Poster Auctions offered several hundred duplicates from the Lipschutz collection for sale. I don't know if the efforts to keep the collection together and find a good home for it went to Lipschutz's satisfaction, but despite of his advanced age, he is still going strong in his publications, and another book on swedish cinema posters is to appear shortly. The book has a 5 page text by Mats Arvidsson in swedish, but otherwise little help for the reader to guide him through swedish poster history, there is no chronological, alphabetic or thematic order and no explanation or description of individual posters. A historian with the zeal and patience of Lipschutz would do wonders for swedish posters, and this book. Born in Odessa, 1920. Went to High School in Paris 1939. Graduated from Gothenburg University in Sociology, Slavonic and Romance languages. Thesis for doctorate (uncompleted): Some aspects of black humor. Went on to work as stand-up comedian, teacher and study tour manager in virtually every country in Western Europe, in North Africa and in the Middle East. After graduating from the National Librarian's High School in Stockholm, set up a cultural centre / audiovisual library, a highly successful exhibition center for scandinavian furniture and handicrafts and became a chief librarian. Speaks swedish, french, russian, english, italian and german. See also the book review in the swedisch newspaper Aftonbladet (in swedish) .